Penyghent is so often the first objective of the Three Peaks Walk - so wonderful scenery like this gets missed by many. The gill takes water down to the River Skirfare which drains into Wharfedale, and it is one of my favourite places in Yorkshire. Approaching the environs of the gill, along the road between Stainforth and Halton Gill, this great view of Fountains Fell presents itself: one of the last great wildernesses in England. Then all attention is focused on the legendary 'hill of the winds' - where today cloud shadows were scudding across its slopes. 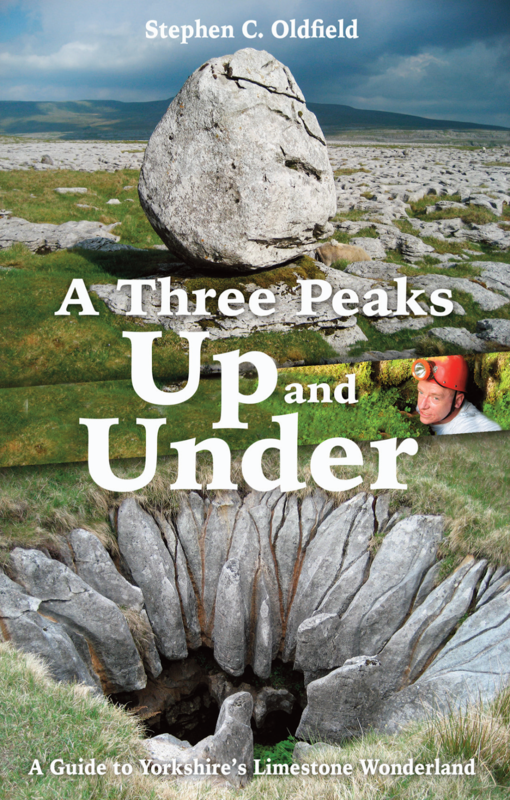 Penyghent has a magnetic quality. As with Ingleborough, the slopes of the mountain itself are made up of the Yoredale Series: alternating bands of limestone, sandstone and shale caused by fluctuating sea levels. The main band of Great Scar Limestone is actually hidden beneath the grass - and a layer of glacial till. Nevertheless, there's still an awful lot going on beneath the surface - with a range of potholes and caves draining the water down to Brant's Gill Head. Here on the east side, the water rushing off the Yoredale Series makes its way through Penyghent Gill to eventually join the River Skirfare - and then the Wharfe: an interesting journey. Over the years they have been greatly disturbed - but they are still well worth a visit. Several skeletons were unearthed at the Giants' Graves - but no true records remain. This gives some idea of the surrounding mound. At the head of Penyghent Gill - it's a relief to meet the Great Scar Limestone after the drab covering of glacial till. Water has played havoc with the limestone here and there are many abandoned passages active only in flood. There's a fabulous high level traverse along the north-western side of the gill, with the beck now far below. It heads towards the lonely Penyghent House. Then the classic view of Penyghent Gill opens up - looking along the limestone to the moorlands above Litton. It's a wonderful spot. Penyghent House is one of the most remote dwellings in England. Imagine living up here in the winter! It also has its very own cave. Penyghent House Cave has a surprisingly large entrance for such a little known cave - and few if any books have ever contained a photograph of it. Shame, as it has an attractive little streamway that children can explore easily - but just ask permission at the house first. Bit of courtesy never goes amiss. Whoops - left my grub bag by the entrance. Not the done thing, Stephen! And let's face it - the view out is special. To make up for the rather annoying 'grub bag' picture - here is the more professional version. Penyghent House backed by its parent mountain - just visible from the path. Looking into the middle section of Penyghent Gill. A grand view of the looming Penyghent opens up - and it now seems to tower over the house, menacingly. Meanwhile, the views into the lower section of the gill are ever more splendid. Terraces of Great Scar Limestone flank the stream on its journey down to the Skirfare. It's a wonderful journey too - completely undisturbed by man. Before heading up - let's have a look at the river up close - a perfect spot for contemplation! Upper Hesleden Cave 1 is reached by a scramble up the steep hillside exactly opposite number 2. It is a hands and knees crawl to a chamber containing a spectacular little waterfall. The entrance is obscure - and you'd never believe it contained so much fun ..
Thing is - you've got to be happy with confined spaces - and it's not the most comfortable! It feels good to see a cave that nobody else ever sees though. Kind of satisfying in a way. A little further on and things get even better. Here is Guy Fawkes Cave. A pothole of the same name leads into it two 'dry waterfalls' above. This cave is a very tight crawl - and must make one feel like Mr Fawkes himself being tortured before execution - but the real reason for the name is far more bizarre. Standing by the entrance - a water-worn slit in the limestone and two 'potholes' called by swirling currents ... and you suddenly realise Mr. Fawkes himself is grinning up at you. Viewed from the top of the cliff above the cave, you can still pick him out with his petrified stare. Peering down the waterfall below Guy Fawkes Cave. Glancing back along Penyghent Gill at our route - with Fountains Fell towering up on the left. Our route ahead - as the gill becomes wilder and more lonely than ever. One of a series of settlements on the opposite bank of the gill - many originate from the Iron Age. Penyghent House now looks a long way behind - with the great mountain now totally dominating the surroundings. Penyghent catching the afternoon sun between the spurs of the gill. Back down to the water - for a deep plunge pool and superb little fall. This is a lovely spot to halt and be alone with nature. The log on the bank shows how ferocious the beck can be when in flood. This pool needs to be seen. It is a stunning place. And time for an old world feel - befitting a place like this. Below the pool - the water has undercut the limestone to leave wedges overhanging the river. And so the gill continues through sylvan surroundings on its journey down to Littondale. Now time to walk back along the course of the river. It's all ups and downs and sometimes you are forced up to a higher level by the terrain. Fountains Fell: it's Yoredale slopes of alternating limestones, sandstones and shales sit on a plinth of Great Scar Limestone like its three more famous cousins. The cliffs of Penyghent Gill are full of highlights, like this attractive little force, plunging through a joint in the limestone. Waterfalls, in fact, are everywhere as we head for the upper reaches. One way into the spectacular upper reaches is to scramble down this abandoned tributary channel. As we once again near the Giants' Graves - the scene becomes ever more chaotic. The entrance to Penyghent Gill in the late afternoon sun. Jumbled boulders of Great Scar Limestone. Water bubbles furiously beneath the chaos on its way into the gill. Come to think of it - these guys look a bit old and wrinkled! Last view of the day - looking back at Penyghent from Dale Head. Park at the Giants' Graves and get to know this superb place intimately. You won't regret it. Release date: May 2015 360 pages.